Rent a bike from Union Square and experience San Francisco like a local. Explore the city's world-class parks, unique architecture, and breathtaking views of the Bay. 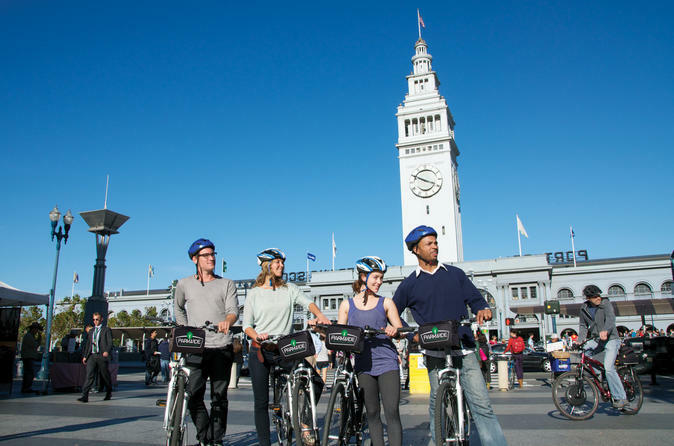 We will show you the route for a breathtaking riide along the Embarcadero on the separate bike path. Stop at Pier 39 and see the sea lions. Continue past the historic Fisherman's Wharf to the National Park Bike Path along the San Francisco Waterfront to the Golden Gate Bridge. Cross the "international orange" Golden Gate Bridge and venture into the quaint town of Sausalito. Riders may enjoy a nice lunch, see the art galleries, and soak in the breathtaking views of Sausalito. Then, take a bike on board the ferry and return back to San Francisco, just minutes from the Union Square location. Cost of the ferry is not included but is well worth the $10. Riders can also venture out from Union Square to Golden Gate Park and enjoy nature in the 100 year old Golden Gate Park. Ride from Union Square, out past the Painted Ladies in Alamo Square Park, to the Haight-Asbury, enjoy the Summer of Love’s 50th anniversary! Bike into the majestic Golden Gate Park and see all of the sights to see through the park, such as the Botanical Garden, the Shakespeare Garden, Stow Lake, & the Bison Paddock. Enjoy the California Oceanfront views, and bike back through the park to our Golden Gate Park location.